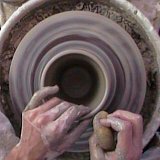 Free clay pot patterns, clay pot projects, crafts and pottery designs. Tons of free lessons, tips, techniques and projects for you to make. 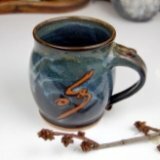 Looking for some new clay pot patterns for your pottery coffee mugs? Below are a few ideas to get your inspiration going. Although a mug is basically just a cylinder with a handle, there are so many variations of it that you can draw from. The two on the left are the same except for the handles. Handles can vary a lot from pulled handles to round coil handles or hand carved handles. They can be "C" shaped or "Ear" shaped like the second mug. The weight of the handle is important. It should be suitable to the weight of the mug. For large coffee mugs the handle will be longer and thicker. Handle shape is important too. In general, it should fit two to three fingers inside it, with a comfortable spot for an additional finger on the outside. What will the mug be used for? This determines a lot about it's shape. The wide mug in the center is for cappuccino. The two tiny mugs are for shots of espresso. The mug second from the right with the very wide base is a type of ceramic travel coffee mug. The bottom is designed to be very stable, while the narrow rim prevents spilling. 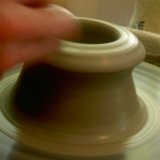 Aesthetics play a big roll in your clay pot patterns as well. How will the mug look? Is it pleasing to the eye? The two tall, tapered mugs in the image are less functional than many of the other mugs, but they have a unique shape that makes them visually interesting. Third from the left is a vase-shaped mug that is also attractive because of it's elegant curves. You can take this to the next level by altering the shape of your mugs. 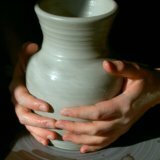 This can be done by stretching or shaping the clay while it is wet. It can also be done by carving into the clay when it is leather hard. Here is an example of a mug that has been altered to make it more interesting visually. I created this mug by throwing an extra thick cylinder, then attaching an extra thick handle. 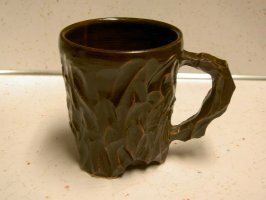 Once the mug was leather hard, I hand carved the bark-like pattern into it with a clay trimming tool. Although the handle looks rough, it was customized to conform ergonomically to the fingers of the right hand. In that way the fashion and the function blend together into a unique, fun to use, design.